It has been many years since I made a trip to the range with @Carlsen Highway my first ever trip to any range was with him, and he taught me to shoot. At that point my problem was an inability to hit an A4 sheet of paper at 25m with a centerfire and my head was cluttered with popular myths and miss-conceptions. Since then I have spent long hours sleeping behind my rifle, to the point where I am now comfortable there. That was until I bought a 7mmRemMag and a 45-70govt. I have not shot a rifle with recoil in a long time. I also had with me a Sako 75 .243 I bought recently that has a can on it. I had a no recoiling rifle on hand for comparison. The 7mm Rem Mag was very pleasant to shoot and bore sighting got it onto paper. Shooting prone off an awkward rest I managed to get it on paper, while Mr Highway put the finishing touches on while I was away looking for some files to sight in the 45-70. The 175g Winchester factory ammo had a solid boot but it was a hearty shove and not unpleasant even for range work prone. The .243 is a kitten and was sorted in minutes. I am not sure what scope I have, as I have not looked, but apparently it adjusts well. 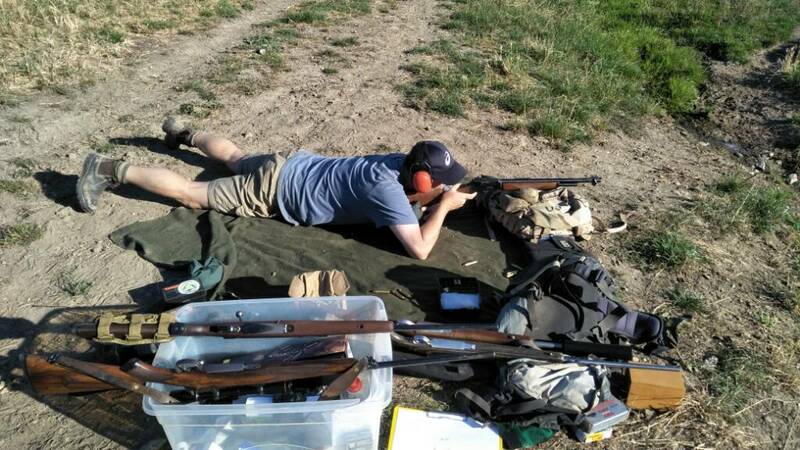 Carlsen Highway checked the zero on his Model 70 30-06 but we never got around to shooting his fine Mauser. Both beautiful classic rifles. Then things got interesting. Since 2012 I have had a 45-70 1895G Guide gun sitting in the cupboard. 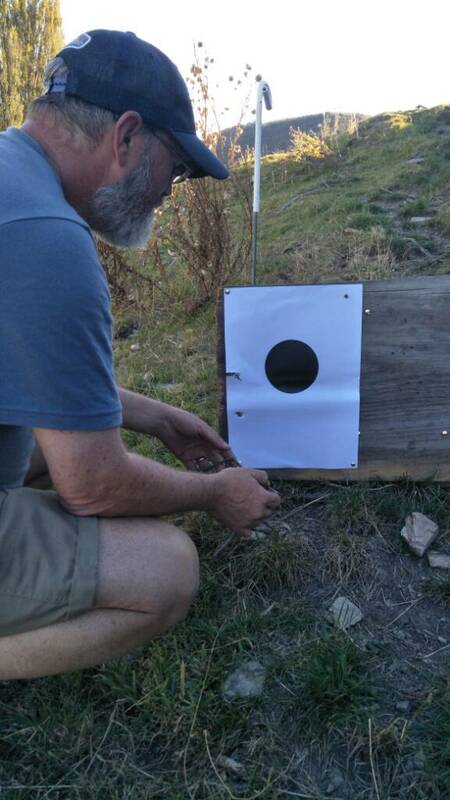 I have shot a couple of cattle with it point blank, but it has never been zeroed since I fitted Skinner peep sights. Carlsen Highway is a savant in the field of sighting in a rifle with a hammer, chisel and file. He zeroed my 1894 .44 Mag around 2007-2008 and the joy of open sights is I have not touched it since. The first round fired sitting by yours truely hit the rock holding our 25m carboard box upright and blew the bottom out of the box. The next round confirmed it was shooting low and Carlsen began filing down the fore sight which was visibly high. The rounds walked up the box as he alternated between firing the rifle, swearing and filing. When he had it where he wanted, we switched to the windage and elevation adjustments in the rear sight and moved out to 100m prone. The little rifle jumped around a bit, to put it mildly. We both punched ourselves in the face at some point. Carlsen developed a headache. We continued. The 325g FTX Hornady factory ammo is lively, but there are worse loads for this gun. The rifle was on an A2 sheet of paper by now and Carlsen fired two rounds which were found on the far left of the target. He moved the windage adjustment the right way (why I let him do these things) and I took over. I found it tolerable to shoot, having let Carlsen H do the bulk of the work and take on the bulk of the bruising. I assured him I had not hit the paper at all. The front sight, rear sight and target were three separate blurs. The little rifles recoil and report was violent. For those wondering about such things, I had a good firm grip on the forend for a change. Carlsen H suggested early on that I remove some timber from the forend, but quickly changed his mind. I suggested adding some lead. 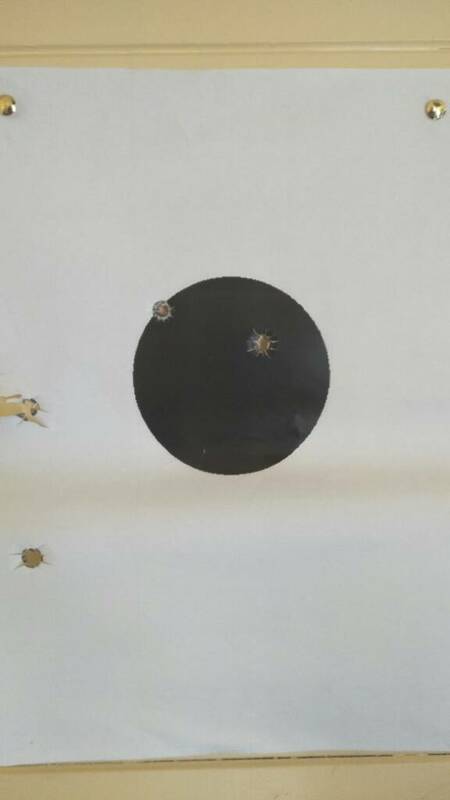 To my complete and total surprise, I had put two rounds into the (large) black dot. Firstly, given that using incremental adjustment on a scope turret rarely comes out this well. I as at a loss as to how someone eyeballs a rear sight, moves it by hand and gets exactly what he is after. Secondly, open sights never cease to amaze me. If you were to think about it, it would never work. If you have faith, trust your eye and squeeze the trigger, weird things happen. I really could not see much. Cheers for the good day Carlsen Highway. veitnamcam, Barefoot, gadgetman and 5 others like this. Last edited by Tussock; 13-03-2019 at 11:38 AM. doinit, gadgetman, R93 and 2 others like this. Where I was confident I did not hit the paper. I know what you mean about the open sights. Many moons ago I bought a couple of broken air rifles from GC for $20 for the pair. I made some replacement bits, a few repairs, some TLC and they would finally let a pellet exit the end they should. 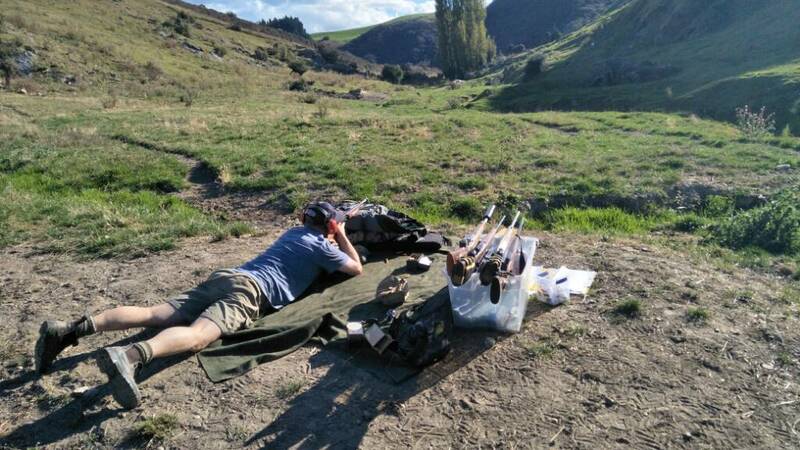 With the open sights I was consistently knocking milk bottle tops sitting flat at 25m. Eyes don't focus close up nowadays so I'm stuck with scopes. If you do not like colorful language, do not watch these videos. In Carlsen Highways defense, he did not know I was filming My job was to shade the open sights by holding up a gun bag. I tucked the camera in behind the bag. veitnamcam, doinit, R93 and 4 others like this. I used to do well with my old air rifle with open sights back in the day and even a season behind a club martini at the smallbore range, so I was disgusted when the Norinco lever 22 I got was just crap. Don't know what was going on there but once I put a scope on, I was fine. Odd. sort of blame the gun, although usually I blame myself. Tussock and sometimes1 like this. This was two or three rounds after he punched himself in the head. I punched myself in the head on my second shot. I'm building a portable standing bench for such occasions. Take a folding seat of some sort and golden. 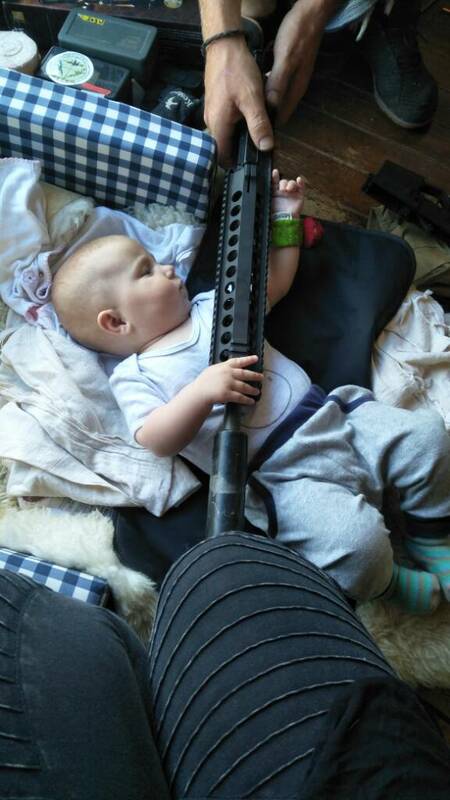 Can even use it to hold the rifle for cleaning. LOL. I didn't even know Tussock was filming or taking photos. He has a comprehensive battery of rifles. The 7mm Remington Magnum was interesting to me since, I have been around them but never got in behind one and run it for a while. The .45-70 stole the show though. A 6 pound .45/70 carbine with an 18 inch barrel, she will lean up and punch you in the mouth if you think you know more then she does. One of the best bits of the day was also meeting Tussock's beautiful wife and new child. I am looking forward to the forum gathering at the winery. People need to put this on their calendar. Barefoot, gadgetman, Fisherman and 3 others like this. Put the keyboard down. Now kick it over here. hmmmm sounds like a candidate for some home rolled black powder (if you can be faffed with the cleanup) for what its worth my .45/70 insert is quite mild with 45grns of 2208 behind a 415grn cast projectile..well mild ish,at the 45grn mark you START to feel recoil...seeing how well projectiles are deforming at that level has me thinking no need to go higher. I love this 45-70. Would you believe I paid $750 for it, maybe $850, in as new condition. It is one or the last original Marlins. Carlson Highway claimed to have put a mark on her filing but to my dissapointment I could not find it. An unmarked gun is terrible for someone like me. She needs blooded. So much fun to shoot. I am going to handload those 325FTX. No black powder. Too dirty! I do need a blackpowder rifle but not this one. I now have the issue that having looked over Carlsenhighway's wood blued rifles I feel a hole in my cupboard that definitely is not there. Not unless I get a new cupboard. Roberts 415grn solid base or the 395grn hollow base seem to be pretty darn good...as said the 45grn loads of 2208 have start of a kick..41-44 are really pleasant to fire ,might be worth a crack so you have something that isnt booting you around but still hits like hammer of thor. Yes, 2208/Varget is the powder for smokeless. You can load it up far enough to give you real velocities and it will hit you hard enough to give you heartache. I think any one can find one of these holes in the cupboard. If they can't, then they need to go back and look harder. Probably just had one of those bloke looks that our other halves always complain about. All times are GMT +13. The time now is 06:40 PM.